Made with SWAROVSKI crystal. Color: White gold. Very elegant, the real thing is more beautiful than pics! 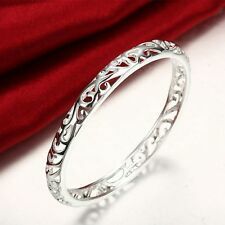 3/6/9/12/15mm Mens Chain Curb Link Silver Tone Stainless Steel Bracelet 7" 8" 9"
925 Sterling Silver Filled 7MM Lovely Filigree Bracelet Bangle. 925 sterling silver Filled Weight: 18 g. The color of photos may vary from different monitor. We also try our best to show the material in a colour that is as close as possible to the original, all our photos are made using light that is as close to natural as possible and avoid color variation. Style: Classic DOUBLE CURB ITALIAN. An effective and inexpensive way to buff your gold filled jewelry with a soft cloth. Make sure any cleaning products you use are safe for gold. Gold Filled Jewelry Guide. 925 sterling silver Filled. The color of photos may vary from different monitor. We also try our best to show the material in a colour that is as close as possible to the original, all our photos are made using light that is as close to natural as possible and avoid color variation. The Evil Eye. Do not wear jewellery when in the swimming pool, sauna/steam room or while bathing or showering. Stares back at the world to shield you from the negativity and harm. Stone type: crystal. Material 18k Gold Filled. This pretty bracelet makes a lovely gift for a friend, family, bridesmaid, or even just for yourself! Padlock Size: 30mm x 20mm. CHUNKY chain link size:10mm. Material: Rose Gold Filled. Color: Rose Gold. Gold Filled Jewelry Guide An effective and inexpensive way to buff your gold filled jewelry with a soft cloth. Silver filled is not to be confused with silver plating as filled literally has 100% more silver than silver plating. Silver filled is much more valuable and tarnish resistant. Material: 925 Sterling Silver Filled. 18K rose gold filled is not to be confused with rose gold plating as filled literally has 100% more gold than rose gold plating. Rose gold filled is much more valuable and tarnish resistant. Material: 18K Rose Gold Filled. The Evil Eye. Do not wear jewellery when in the swimming pool, sauna/steam room or while bathing or showering. Stares back at the world to shield you from the negativity and harm. eye size: approx 7mms. Each Item Includes 3 Pcs Of Bracelets. MENDINO Men's Silver Curb Link Chain Bangle 316L Stainless Steel Bracelet 8.5"
Brand: MENDINO Material : 316L Stainless Steel Main Colour : Silver Bracelet Size : 215mm(8.5" L) X 12mm (0.47" W) Net Weight: Approx.54 grams Its special design will make you look unique. It is a good gift for your lover, family, friend and coworkers. Warm Notice. Natural Han Jade (cold jade)( identified). Jade information. Bead 10mm, length adjustable (stretch). Remark: because the beads are round, and it is polished by human beings, so there are minor errors, Eg. 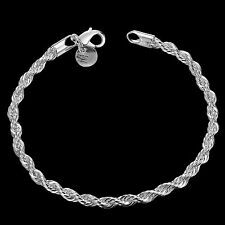 Stunning 925 Sterling Silver Snake Chain Bracelet. Width: 3mm. Material: 925 Sterling Silver Filled. Includes FREE Sparkly Jewellery Gift Pouch. Length: 20cm. The Evil Eye. Do not wear jewellery when in the swimming pool, sauna/steam room or while bathing or showering. Stares back at the world to shield you from the negativity and harm. eye size: approx 6mms. 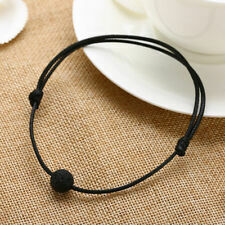 Bracelet Size: 20 8 cm. The color of photos may vary from different monitor. We also try our best to show the material in a colour that is as close as possible to the original, all our photos are made using light that is as close to natural as possible and avoid color variation. Gold-filled jewelry is a reasonably priced, quality alternative to solid gold (Ease your mind about losing expensive jewelry but still makes you stand out in occasions like wedding, parties, etc.). An effective and inexpensive way to buff your gold filled jewelry with a soft cloth. 925 Sterling Silver MOP Evil Eye Bracelet With Cubic Zirconia Cross. Evil eyes have been worn for centuries to ward off evil spirits. Material: 925 Sterling SIlver, Mother of Pearl & Cubic Zirconia. Cubic zirconia encrusted cross lies along the length of chain. 925 sterling silver highly polished solid cross centred in a silver rolo chain bracelet. 925 Sterling Silver Sideways Cross Chain Bracelet. 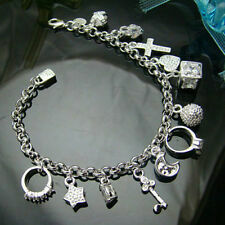 Designer sterling silver sideways cross chain bracelet. 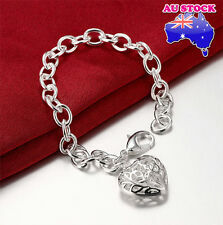 Length of bracelet: 17 cm 2 cm extension approx. 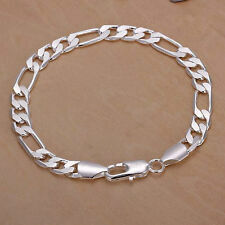 Brand: MENDINO Material : 316L Stainless Steel Main Colour : Silver Bracelet Size : 228mm(9" Length) * 16.5mm(0.65" Width). Stainless steel does not rust or stain with water as ordinary steel does, and it's one of the most bio-compatible metals. Stainless steel jewelry is popular among those who may have metal allergies, because of its anti-allergic Such advantages make it a more popular accessory as one of the strongest of all jewelry metals, It does not oxidize and will be very durable. All makes it a top fashion accessory to complement your wardrobe. Material: stainless steel Color:silver Including one blue velvet jewelry bag This heart link bracelet is crafted from stainless steel and high polished design, delicate arts and crafts, which make you look unique in any occasions. Silver filled is not to be confused with silver plating as filled literally has 100% more silver than silver plating. Silver filled is much more valuable and tarnish resistant. 925 Sterling Silver Filled. 18K Rose Gold Filled Weight: 6.8g. The color of photos may vary from different monitor. We also try our best to show the material in a colour that is as close as possible to the original, all our photos are made using light that is as close to natural as possible and avoid color variation.